Our finest hot applied crackfilling material. Designed for use in both direct fire and oil-jacketed kettles. Ideal for all crack filling applications. 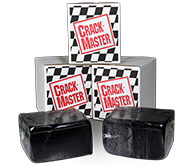 CrackMaster™ Supreme is a single component, hot-applied, rubberized asphalt crack and joint sealant. CrackMaster™ Supreme is specially formulated for both direct fire and oil-jacketed melters. It is heat stabilized to withstand temperatures up to 450°F without experiencing polymer degredation. When melted and properly applied it forms a resilient crack sealant for both asphaltic and cementatious pavements. CrackMaster™ Supreme meets manufacturer’s specifications. CrackMaster™ Supreme is designed to seal expansion joints, longitudinal and transverse cracks, joints between concrete and asphalt shoulders, and random cracks in both asphalt and concrete pavements. CrackMaster™ Supreme is relatively hard and has a high softening point, which makes it well suited for parking lots and driveways. Use material as supplied. Do not blend with other materials.. Apply heated CrackMaster™ Supreme using either a pump and wand system or a pour pot. For best results the sealant depth to width ratio should not exceed 2 to 1 (i.e. 2-inches deep to 1-inch wide). The cooled sealant height should not exceed 1/8″ above surrounding pavement. Using a sealing shoe or squeegee, band the material 2 to 3 inches wide over the crack.